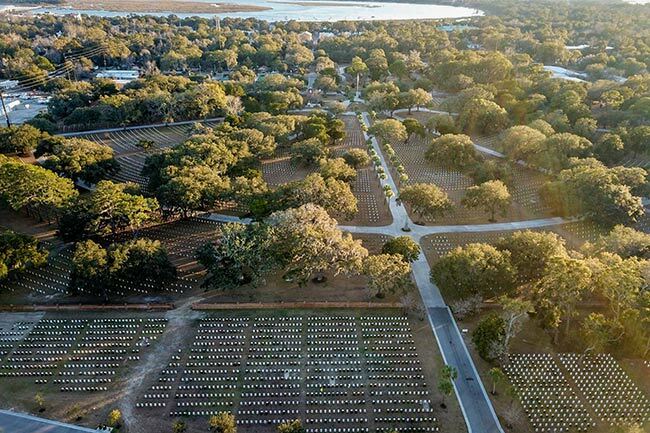 Designated by Abraham Lincoln on February 10, 1863, Beaufort National Cemetery is one of the oldest United States National Cemeteries. It is located on 33 acres in the heart of downtown Beaufort. 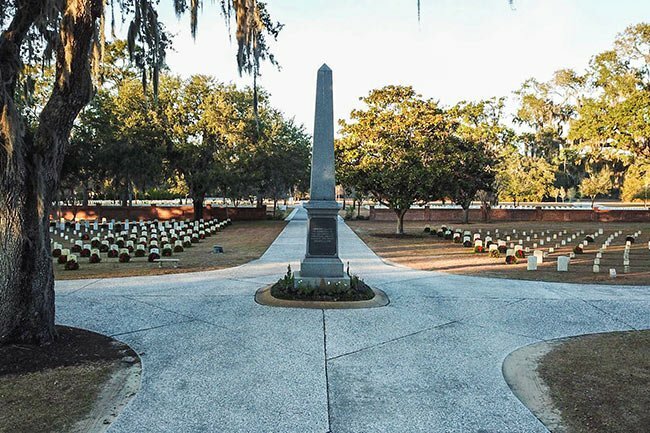 Veterans from every conflict since the Civil War have been laid to rest here; the cemetery contains over than 18,500 graves. In 1987 the remains of 19 Union soldiers were found on Folly Island near Charleston by beachcombers with metal detectors. The remains were later identified as members of the 55th Regiment and the 1st North Carolina Infantry, both comprised of African American soldiers who fought alongside the famed 54th Massachusetts Regiment. On Memorial Day of 1989 the veterans were re-interred here; an Honor Guard of actors from the movie Glory, which at the time was being filmed near the cemetery, presided over the ceremony. The movie tells the story of the 54th Massachusetts Regiment. 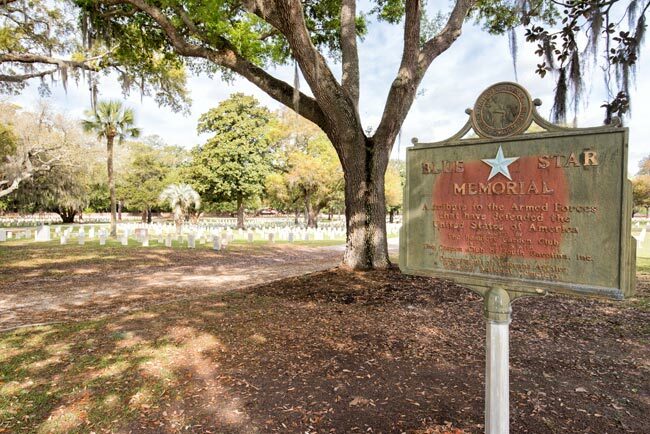 Visitors to the cemetery may notice the Blue Star Memorial Highway marker within the grounds. The Blue Star Memorial Highway program began in 1945 to honor all Unites States military servicemen and women; markers are placed along highways as well as sites dedicated to veterans. The marker standing at Beaufort National Cemetery was installed by the Beaufort Garden Club in 1998. Two recipients of the military’s highest decoration, the Medal of Honor, are buried here. 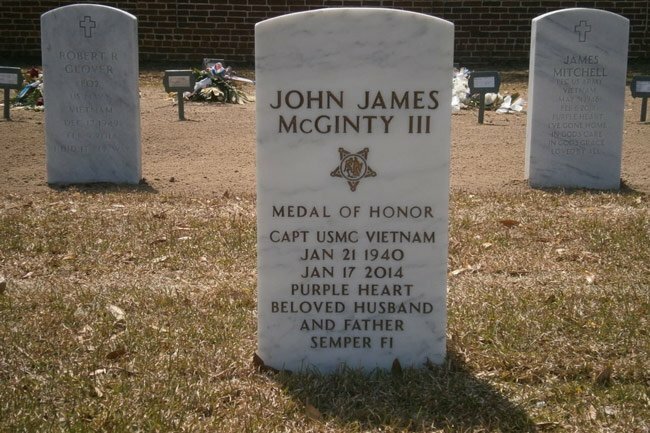 Captain John James McGinty, III was instrumental in Vietnam’s 1966 Operation Hastings. The operation succeeded under McGinty’s leadership, driving the North Vietnamese Army beyond the Demilitarized Zone. 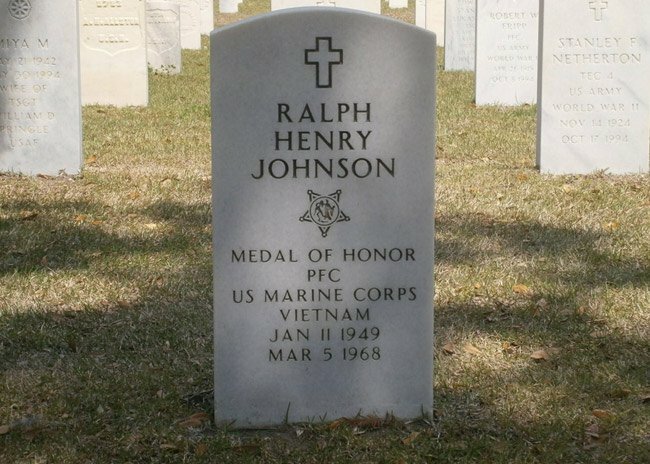 Private First Class Ralph Henry Johnson was only 19 years old when he threw himself on top of a live hand grenade to protect a fellow Marine as well as his patrol perimeter during the 1968 Operation Rock in Vietnam. The Charleston native died instantly in the blast. 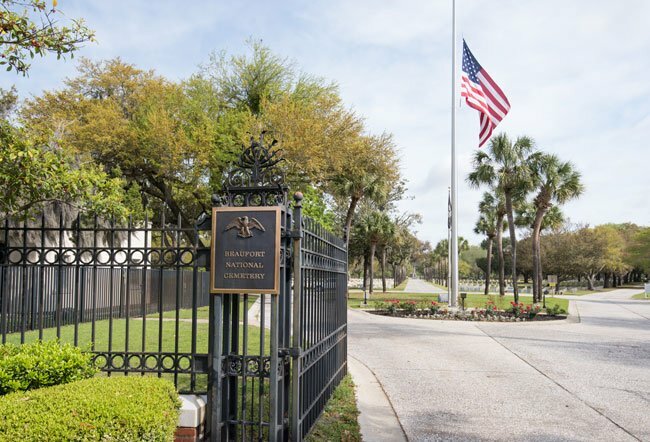 The Ralph H. Johnson VA Medical center in Charleston is named in his honor. 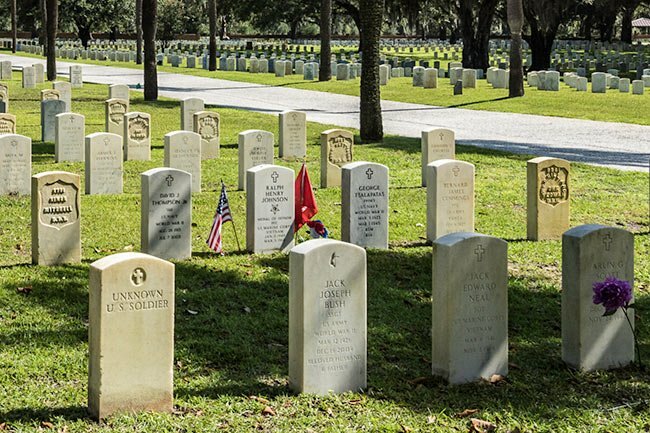 South Carolina has two other national cemeteries, Florence National Cemetery in Florence and Fort Jackson National Cemetery in Columbia. 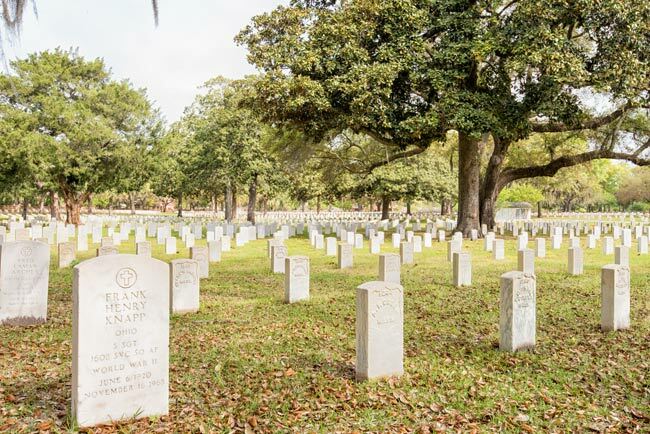 The Beaufort National Cemetery is significant because of its association with the Civil War as well as beyond the Civil War era, as the remains of veterans associated with every war and branch of service are interred here. 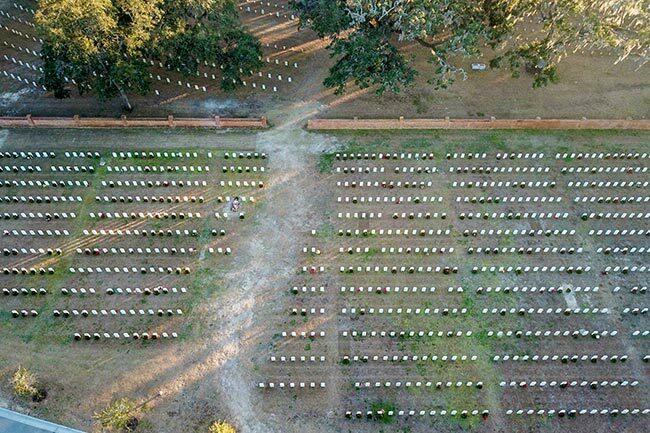 The national cemetery was established in 1863. The period of significance ends in 1942, the year that Machinist Mate Gerd Reussel, a German World War II prisoner of war, was buried in the cemetery. The site is laid out in the shape of a half wheel. The cemetery’s roads form the spokes, and the large iron gates are set at the hub. The main entrance is at the center of the south side and is protected by a double iron gate, which was constructed in 1940. The cemetery was originally enclosed by a wooden picket fence, which was replaced with a brick wall circa 1876. The original lodge was a wooden cottage with three rooms, which was constructed outside the walls of the cemetery and was moved to inside the cemetery in 1877. In 1881, a lodge of the standard design by Quartermaster General Montgomery C. Meigs, was constructed near the former lodge. The Meigs lodge was used until 1934, when a new two-story brick and frame Dutch Colonial Revival style structure was constructed. The brick and stucco maintenance building, with a galvanized metal roof, was constructed in 1894. Three commemorative monuments or memorials are also located in the cemetery. 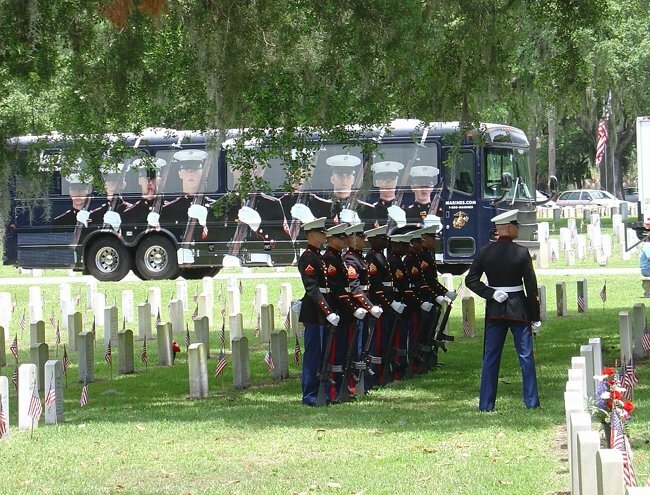 Semper fi and RIP veterans and family members. I spent many a morning at BNC as a member of the Parris Island Honor Detachment. I have several friends at rest there. A truly wonderful place, all of the “neighbors” are very special people. My parents are buried there. My mother died in 1989 and my father in 1999. I live in Montana now, so I don’t get to visit. My niece just graduated basic training last Thursday at Ft. Jackson and my brother and sister in law came from Albuquerque, NM for it. After the graduation, they came down to Beaufort to visit Mom and Dad’s grave, and my niece left the flowers that she got at graduation on their grave. This cemetery is such a beautiful and restful place, and the graves are well taken care of. My father served 2 years during WW2, then finished his degree, and then a few years later, rejoined the Air Force and served another 26 years, serving in the Vietnam War as well. My great-great-grandfather is buried here. He died in 1863 of typhoid fever while fighting with the 142nd Infantry out of N.Y. Enjoyed reading this! I thought Gettysburg Cemetery was the oldest of the Civil War. Thanks for your info! Hi, Jack. There is a website for the cemetery posted above the map. Hopefully, that will help you with scheduled events. Best of luck! Where can I find a listing of events held at the cemetery, i.e. 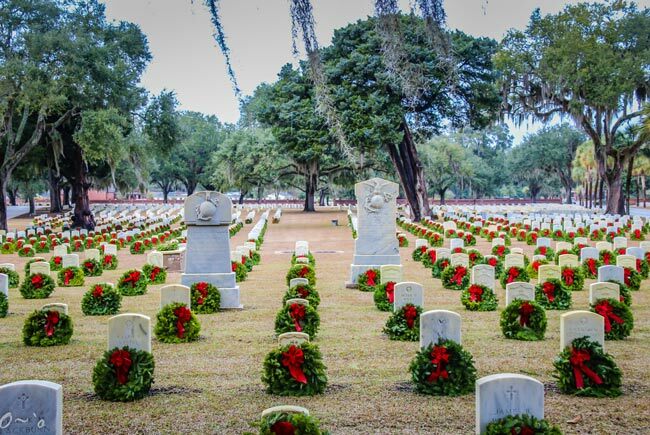 Wreaths Across America, Veterans Day, Memorial Day? Hi, Stella. There is a website above the map; someone from the cemetery might be able to help you with that question. Best of luck.